This tattoo has totally put me off getting more. 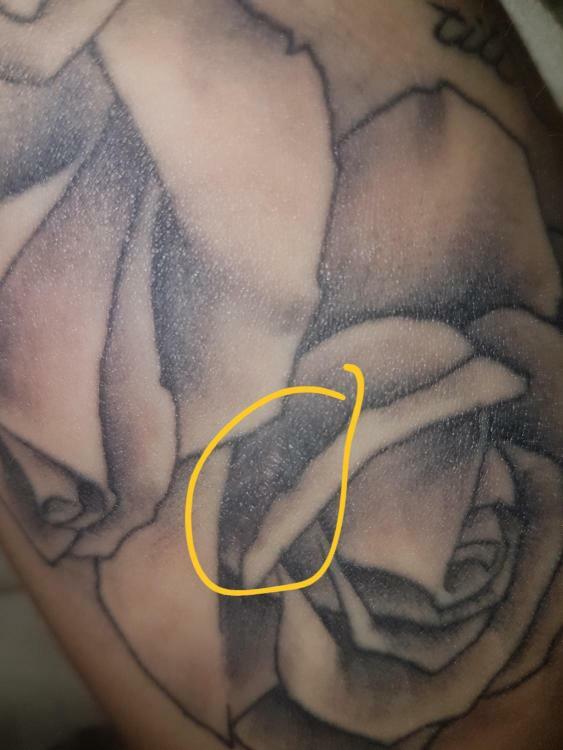 I had a touch up done 10 days ago on the circled part but it's gone back to looking exactly the same as before it was touched up. I dunno if the picture is very clear but theres like a white patch in the shading. Is it scarring? let it set for awhile. 10 days is too early to tell or get a touch-up. LOL stop looking at it with a magnifying glass. Let it heal and set for a while. And quit staring at it. Please. For your own sanity. Hey @emmar15, you are going to have to give it time to heal. It may take 6-8 weeks to fully settle in. No one here is trying to be mean...just realistic. I have had tattoos that took a couple of months to settle in and now they are beautiful, imperfections and all. This is part of the deal with tattoos. Breathe. It's all gonna be okay. Please don’t get any more tattoos. They will never be perfect, and you will drive yourself nuts. You are anticipating a scar that doesn’t exist. That’s not good. Tattoos aren’t for everyone. If you can’t wait a month or two to see how it will come out, you may not have the tempment to get tattoos. And I sure as hell wouldn’t go back to someone who would do a touch up 10 days after doing the tattoo.